Earlier this month, the head of the University of New Mexico's Gallup campus was under fire for spending public money on a Bigfoot conference and expedition. Never mind that there are no fossils, no corpses, no DNA samples, nor any other hard evidence to suggest Bigfoot exists. Nearly 50 years after the famous Patterson–Gimlin footage was shot in northern California, people are still looking for hairy hulking apemen (fewer apewomen) hiding from us in the forests. To the collective annoyance of skeptics, these stories aren’t likely to go away any time soon. Just take a look across the globe and back through history and you’ll find that lots of cultures have tales about shaggy, often smelly cryptids (animals of unproven existence). 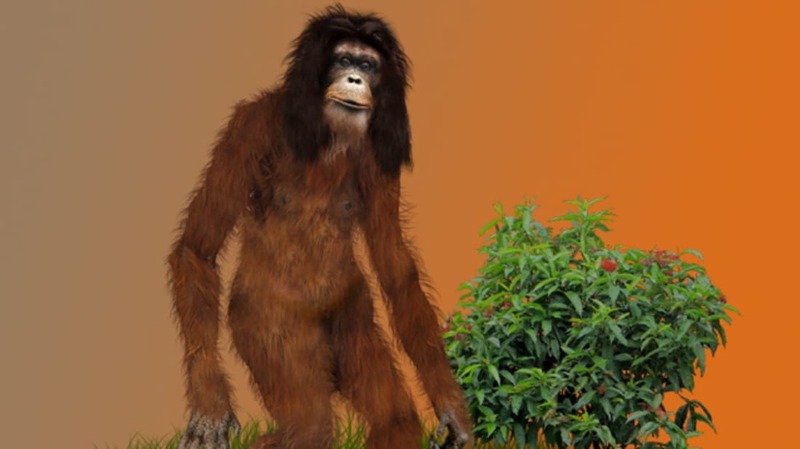 In their 2013 book Abominable Science, authors Daniel Loxton and Donald R. Prothero acknowledge that Bigfoot myths might enjoy plausibility for a good evolutionary reason: There was a time when “footprints in the mud really did mean that another bipedal primate was lurking about.” Indeed, our human ancestors used to share forests with once-mysterious orangutans, gorillas, and, a very long time ago, the now-extinct primates like Gigantopithecus. Today, Bigfoot, or Sasquatch, dominates the lore of North America. But here are 15 hirsute alternatives that show just how ubiquitous these mythical creatures are. The screeching, putrid-smelling, campsite-wrecking Mogollon Monster is said to stalk Arizona’s Mogollon Rim. The first record of a sighting might come from a 1903 edition of The Arizona Republican, in which a man named I.W. Stevens claimed he saw a clawed apeman that was covered in gray hair and had a matted beard that reached to his knees. This beast carried a club, drank the blood of cougars and “screamed the wildest, most unearthly screech,” according to Stevens. He himself never claimed it was a monster; instead, he speculated it was someone held hostage and then abandoned by Native Americans. Several decades later, future cryptozoologist Don Davis claimed he had his own encounter with the Mogollon Monster during a 1940s Boy Scout camping trip (he was 13 at the time), noting that the creature had deep-set expressionless eyes, a square head, and a stench so bad Davis thought he had soiled his sleeping bag in terror. Apemen—and apewomen—come in all sizes. On the Indonesian island of Flores, “Ebu Gogo" means “the grandmother who eats anything.” These fabled creatures are said to be diminutive, hairy, and pot-bellied. Some believers have tried to link these cryptids to the hobbit-like human Homo floresiensis, whose bones were also found on Flores. But recent research suggests that species died out 50,000 years ago. In Central Asia, Bigfoot takes the form of the Almas. This legendary apeman of the Altai Mountains is supposedly more humanoid in form than the North American Bigfoot, and some cryptozoologists have tried claiming that Almases might make up a holdout population of Neanderthals. Close encounters have not been limited to sightings of shadowy figures in the woods. In one troublingly racist episode from the 19th century, a woman of African descent named Zana was held captive in Russia by villagers who suspected she was an Almas. Worse, some scientists today are apparently still trying to prove she was not human. Bigfoot’s best known (and perhaps most-sought) companion might be the Yeti, or "Abominable Snowman,” who roams the Himalayas. The Yeti has its origins in old Sherpa folklore, but it became the hulking shaggy apeman of pop culture after Western mountaineers started exploring Mount Everest in the 20th century and came back with sensational tales. In 1959, the American Embassy in Kathmandu released a memo notifying would-be Yeti hunters that they would have to apply for a permit with the Nepalese government and could photograph but not kill any Yeti they might find. Malay for “short man,” the Orang Pendek supposedly lives in the jungles of the island Sumatra. This ground-dwelling, pint-sized creature is said to have long arms and broad shoulders. It apparently lacks special powers—though it might throw rocks at you if it feels threatened. Alaskans have a rather demonic version of Bigfoot: kushtakas. In the language of the Tlingit indigenous tribe of the Pacific Northwest, “kushtaka” means "land otter man.” Sure, otters are cute, but kushtakas have the not-so-cute ability to shape-shift, possess people, steal souls, and cause landslides. In The Strangest Story Ever Told, miner Harry D. Colp claimed that one of his companions was beset by a swarm of these sexless, sore-covered, monkey-like creatures during a prospecting trip in southeastern Alaska’s Thomas Bay in 1900. Undaunted by such accounts, actor Charlie Sheen reportedly took a private jet to Alaska to hunt kushtakas in 2013. He did not find any of the elusive creatures. In the 1920s, Swiss scientist George Alexis Montandon claimed he had evidence of a human-sized ape that lurked in Venezuela. It wasn’t until the late 1990s that the so-called De Loys’ Ape was revealed to be a hoax based on a manipulated photo of a common spider monkey. People living around Mt. Hiba in northern Hiroshima during the 1970s claimed to see an ape-like man, shorter than the American Bigfoot and with a coat of reddish brown hair. The so-called Hibagon apparently created such a frenzy that police for a time escorted children to school. One grainy (and not very convincing) picture purports to show the Hibagon, but other than that, there’s no other evidence for this creature. Besides Bigfoot, there are several other monsters said to terrorize North America. There’s Momo in Missouri, the Tuttle Bottoms Monster in Illinois, and of course the Ohio Grassman. According to one Bigfoot enthusiast website, the Grassman looks like an upright chesty gorilla who hangs out in cornfields and is known to kill dogs. Roaming the wilds of the Florida Everglades is a man-beast covered in fur that is variously known as the Skunk Ape, Swamp Cabbage Man, or Stink Ape. It’s said to have the odor of rotten eggs—maybe because, as some claim, the Skunk Ape lives in muddy caves. The creature is occasionally drawn to campsites and cabins in search of food, but, according to other reports, the Skunk Ape might be a picky eater. Some say it’s been known to kill deer, tear open the carcass and only eat the liver. In the Brazilian Amazon, people claim to have had encounters with the sluggish and clawed Mapinguary, a name sometimes translated as “the roaring animal” or “the fetid beast.” The legends about this creature could possibly be based on ancient memories of the elephant-sized giant ground sloth, Megatherium. This real-life sloth went extinct in South America a few thousand years ago, but fossil evidence shows that humans once hunted them. Another apeman said to be hiding out in the rainforests of Brazil is the Maricoxi. A decade before he disappeared while looking for an ancient lost city in the Amazon, explorer Percy Fawcett claimed he saw several Maricoxi in Brazil in 1914. Fawcett described them as “enormous” grunting creatures which were hairy like dogs. In one encounter, he said that he used his gun to scare off one of these bow-and-arrow–armed apemen.